Attempt saved. Wout Weghorst (VfL Wolfsburg) right footed shot from the centre of the box is saved in the bottom right corner. Assisted by Josip Brekalo with a cross. Attempt missed. Maximilian Arnold (VfL Wolfsburg) left footed shot from outside the box is close, but misses to the right. Assisted by Yannick Gerhardt. Attempt missed. 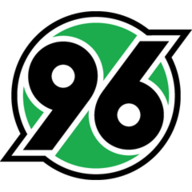 Noah Joel Sarenren Bazee (Hannover 96) right footed shot from the right side of the box misses to the left. Assisted by Josip Elez. Attempt saved. Josip Brekalo (VfL Wolfsburg) right footed shot from the left side of the box is saved in the centre of the goal. Assisted by John Yeboah. Attempt saved. Jérôme Roussillon (VfL Wolfsburg) left footed shot from the centre of the box is saved in the centre of the goal. Assisted by Wout Weghorst. Attempt saved. Maximilian Arnold (VfL Wolfsburg) left footed shot from outside the box is saved in the centre of the goal. Assisted by Jérôme Roussillon. Attempt missed. Daniel Ginczek (VfL Wolfsburg) left footed shot from a difficult angle on the left is too high. Assisted by Yunus Malli.